Until now, I’ve neglected to share anything from my trip to Washington, D.C. As impactful as it was, I’ve been too busy ever since I returned home to solidify any thoughts and type any of them down (but that’s no excuse, and I know it). These images, however, has been stuck with me ever since. It’s not a burden, though; I’m actually glad I was able to capture them. I didn’t know why I needed to take these pictures when I did, but I did anyway because I felt like it needed to be done (attribute it to being an INFJ if you must). We begin at the waiting line of the United States Holocaust Memorial Museum. After driving through the Sunday night/Monday morning, we were too pooped for anything major on Monday night. Bright and early Tuesday morning, however, we were greeted by the United States Holocaust Memorial Museum. However, we spent a good amount of time in the wrong waiting line. Apparently, we were lining up for specially guided Foreign Language tours. We didn’t know why we felt like we were on the back end of the Tower of Babel until some tour guides who could speak English were able to help us out. 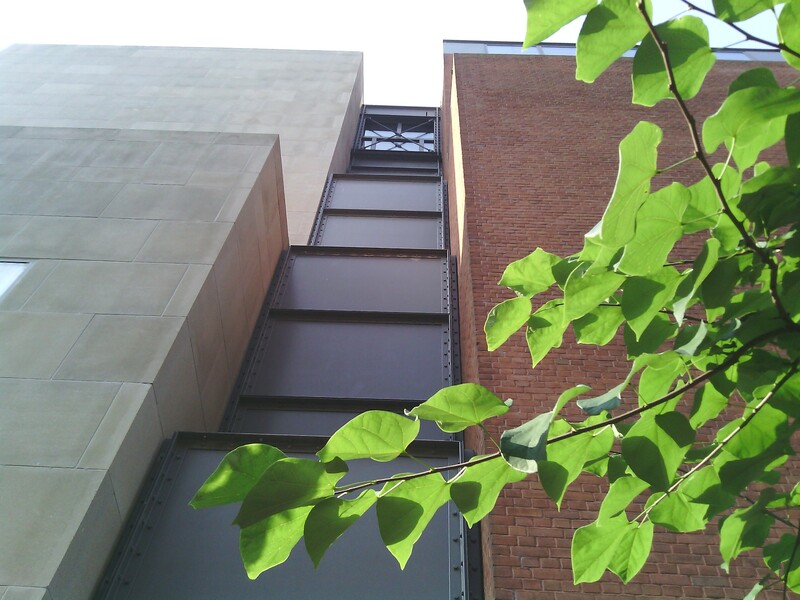 Thankfully, they showed us where our waiting line was, and we booked it to the spot: a brick wall with built-in concrete benches that faced the side of the museum’s building and separated from it by a sidewalk. 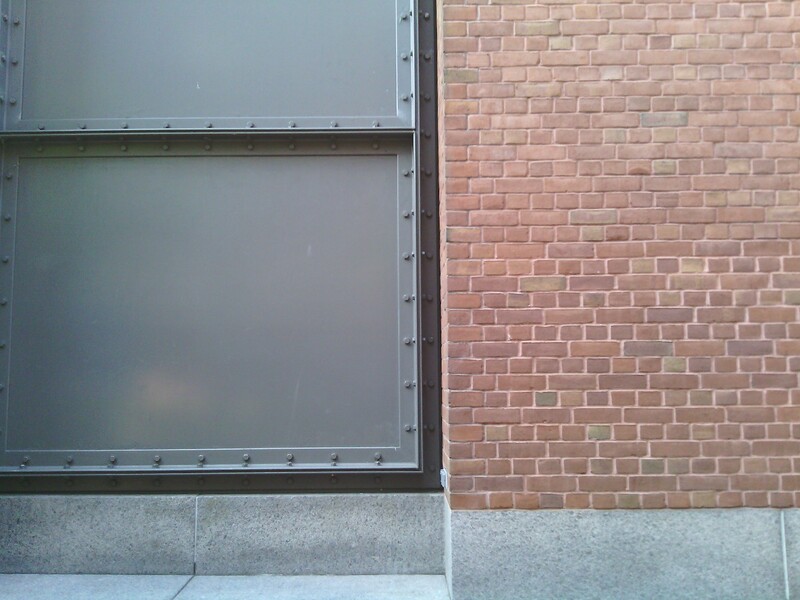 I sat looking at two different edifices: the steel and the brick. From my bench, my line vision of divided in half: the cold, gray steel on one side, and the natural red brick on the other. There exists an interesting, intriguing, and even poetic juxtaposition between the two. Nuts and bolts bullet the steel frame which held the panels in place, and I think of the Nazi party and as “structured” and “firm” it was on the outside thanks to the facade its leaders gave it. This trait is also found in the harsh exterior of the concentration camps and the grotesque devaluation of human life which was housed and perpetuated within them. The opposing brick then made me think of the people who were left on the outside of this stronghold and left defenseless: the Jews themselves. They began just as clay does as it is removed from its home in the subterranea of the earth and ended in being removed from the crematoria just as a horde of brick is removed from the kiln. They were the bricks upon which the Nazis built their power and would have continued to fuel had not the camps been liberated. It’s in this “liberation” where the branch in this picture comes in. In this next picture, we see the steel panels and the brick wall side by side in the background. In the foreground, however, is a branch from a thankfully well-placed shade tree – one of many that also lined our concrete benches. The branch in the picture then becomes a symbol of everyone that came into the camps and abolished them. Armed forces from Great Britain, France, Canada, and the United States all stepped up and did their best to rescue any survivors from these hell-houses. …and the value of human life was revived. That’s what we have to remember about this whole ordeal, I believe. Sometimes, we want to remember only the bad, and the United States Holocaust Memorial Museum is full of plenty of the bad that the Jews went through – two out of four floors of it, to be exact. It’s easy to not want to stop thinking about these atrocities because we see it all around us still today among the different peoples of the world, and we kinda put ourselves in a bottleneck of perception where we can only see what’s closest to us and lose all hindsight and foresight. But the branch still grows, and life goes on. That’s the beauty of how God’s world works, and that should encourage you as much as it does me.